Executive Mosaic is honored to introduce Mary Davie, assistant commissioner for the General Services Administration‘s office of information technology category, as an inductee into the 2017 edition of the Wash100 — Executive Mosaic’s annual selection of influential leaders in the government contracting arena. Davie oversees the management of cost control, investments, rate setting functions and bottom-line operating results for the GSA. GSA rebranded in January its integrated technology service to the office of IT category and updated the ITC’s framework to align with other agencies and industry partners. ITC was established to help bolster deliveries of products and services to GSA customers and support agency missions as well as foster innovation via IT category management. 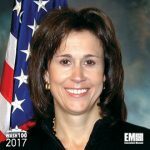 Davie first joined GSA in 1989 and her roles since have included assistant commissioner of assisted acquisition services and acting commissioner of the Federal Acquisition Service. During Davie’s tenure as assistant commissioner of the former GSA ITS office, the agency teamed up with the Defense Department and OMB to co-host information sharing and collaboration sessions to provide software category management assistance to agency software license managers. The Enterprise Software Category team also aids efforts for the implementation of the Making Electronic Government Accountable by Yielding Tangible Efficiencies Act. GSA also consolidated one program office and 11 regional programs for network services into a single national program that will be in charge of the procurement of regional and wide-area network telecommunications services in preparation for the Enterprise Infrastructure Solutions contract vehicle. Executive Mosaic congratulates Mary Davie and the GSA team for their selection to receive this award.